When you are adding Language Rich activities to your Library be sure to provide some information and instructions for use. St. Mary’s County Library uses the sign below at each center or activity. 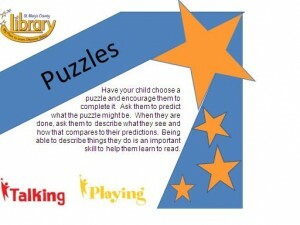 Included is some suggestions for use and the Every Child Ready to Read practices that are strongest in the activity. Some have all 5! Make it short and sweet- they don’t have to be long technical instructions that use lots of literacy jargon. Just a few ideas on how to use the space. Make it noticeable- Use the same format for all of your instructions so that they can be easily recognized. Make it valuable- Introduce the Every Child Ready to Read practices: Read, Write, Sing, Talk and Play! Sure! Email me at aellington@stmalib.org and I will be happy to send them over.